We had a wonderful stay here. Food, hospitality and the ambience are superb. 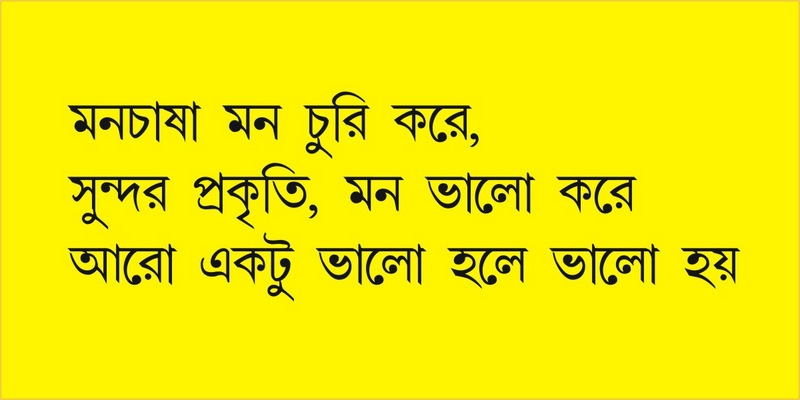 Thanks to Debjani Basu for her concept. Beautiful experience. Good Service. Suggestion: We had a boat ride. Hope a better arrangement can be made. This Place is really beautiful. ATTRACTIVE LIVING PLACE ALONG WITH FOODING. A beautiful weekend destination for all without age – limit or wants. We will visit again as soon as possible. This is my first visit to Monchasha. A beautiful weekend destination to spend one’s leisure time. Wonderful experience, tasty food & great staff. This is my second visit to this place. The place is as beautiful as I have seen an year back. A remote place which has been made available to city people like us, so that we can draw the pleasure of the rural charm too. Wonderful food & great staff. Thanks to all of u. 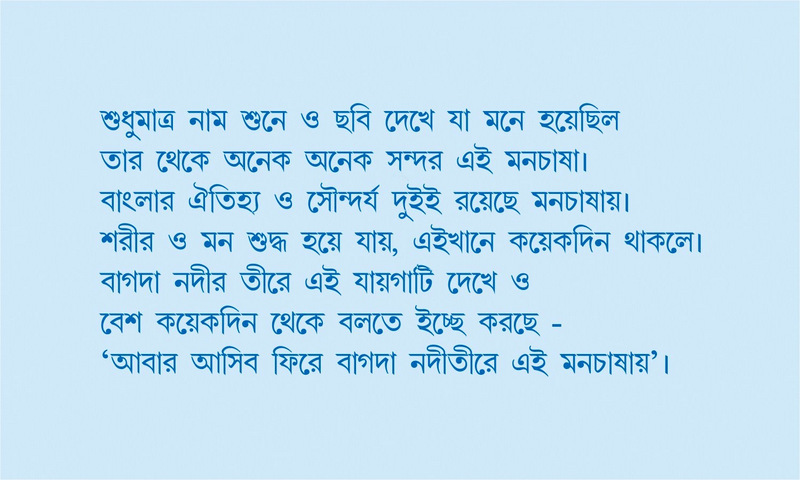 Nice Place for those who have interest in Gram Bangla. Cool concept Village. Sanitised & well attended. Would love to be back & recommend. Beware of rats & insects. Awesome village concept. Back to village life with modern facilities. Crazy insects – Loved to roam around and away from them. Badminton was awesome Experience. Crazy insects, Great Place & Amazing Service though. This was our 1st visit. Heard lot about it earlier. Nilanjan & Debjani are just awesome. Real place on the lap of the nature. Food was too good. Loved the place. This was our 1st visit. The wonderful ambience & the rural touch is really good. Food is excellent, services are very good. Only care to be taken is pest control and a provision of better light both outside & inside the cottages. Monchasha – when I heard the name of the tourism, the first impression in my mind was not that serious, was in dilemma whether it will be worthy. A soon as I stepped in I could BREATHE THE FRESH NATURE. Fooding lodging was just perfect. Hospitality of the staff was very homely which we tourists miss when out of home. In One Word My Experience is – AWESOME. KEEP IT UP. You are real “CHASHA”s. This was our 1st time visit. Feeling just Crazy. Fooding just 100 stars. Such a rural authentic feeling. Very nice. Excellent. Utensils makes us very hungry. This was our 3rd visit. Just fell in love with the overall ambiance, food and the closeness the place has with the nature. Gives a feel of rural Bengal. Services are also very heartwarming. It is very enjoyable to spend some days within nature. and it is to be remembered the cordial behavior of all people who looked after us. Lovely place close to nature and very close to my heart. Felt like my home place after ages. Great Hospitality. Would love to be back again. Very nice experience. This was our 2nd visit. keep it up team Monchasha. I love this place & I live you all. Monchasha is a place full of lovely animals, birds and above all full of lovely people….. This was a unique experience that I have never had before…… THANKS A TON! A home away from home. Excellent Hospitality & warmth of the staffs has left us spellbound. The beauty of this place is very soothing to the soul. A place where I could connect with my inner soul. Away from the hustle and bustle of regular citylife for 4 days, we are returning fully refreshed. All this with the excellent hospitality! Tremendous effort in recreating rural Bengal and our culture – things which were on the verge of extinction. Kudos for the great effort. This is one of the most beautiful establishments I have ever resided in. It is a land mark in the field of eco-tourism with excellent out-of-the-box service. This was a beautiful Experience. Really awesome Experience. The atmosphere, the food, the behaviour of the staffs are excellent. Here every reacts in such a way that we are family members. I will come again and again & will tell others to come here ab=nd feel the experience. Excellent stay. This was our 2nd visit. Each time it has a different flavour. Monchasha is a beautiful place to come to! Gardens are wonderful and the people are so friendly and always smiling. We loved our stay here and we will recommend it to everyone we know!! Come to Monchasha to take fresh air with cultural test of Indian village life within west Bengal & till the heavenly nature. This was the best weekend spend this year in the lap of natural leaves! Nature at its best. Hope to come back again with your hospitality. Dont change. Shall come back to see you the same! Wonderful experience of village life. yet with all modern amenities, do not feel like leaving today. Thanks to the entire staff for exceptionally excellent service. Just a small suggestion – A small traditional local program in evening will greatly enhance the already fantastic experience. Thank u for such a lovely stay. We had a great time and a special thank you to Mithun & Chiranjit for the wonderful service. Will plan the next visit as soon as we can. Very happy to be here. Will continue to repeat this trip again and again. 5th Trip. So nothing much to write. It witnesses to be great. A well spent holiday. The staff are very good. Very homely atmosphere. Very much recommended for people living in the hustle bustle of city. Very memorable, excellent service. Will definite comeonce again. Excellent facility.. great food.. amazing service. will visit one again. It is an exemplery sight. Most beautiful in all respect. Great food, great ambiance, good people, both Mithun & Chiranjitthe, Overall good experience. Will come back soon. Lovely stay. amazing service. great food. Overall good value for money. A Definite come back place. Splendid stay. Monchasha is an ideal place to revitalise your mind. Superb food & courtesy extended by the staff was excellent. A real Home away from home. Thanks. The atmosphere brought me to the ancient village and our country because of you I got to see the real village experience. Awesome food and stay. Brilliant customer welcome! Keep up the good work. Marketing & promotions needs to be done on large scale. Fooding & Lodging both are excellent. Maintenance is not upgraded. Service is satisfied. All in all it was a satisfactory stay. thank you. Fooding & Lodging both are too good. Will come again. Thanks. The very site and atmosphere of Monchasha appeal to us very much specially for its peaceful & serene surrounding of solitude. 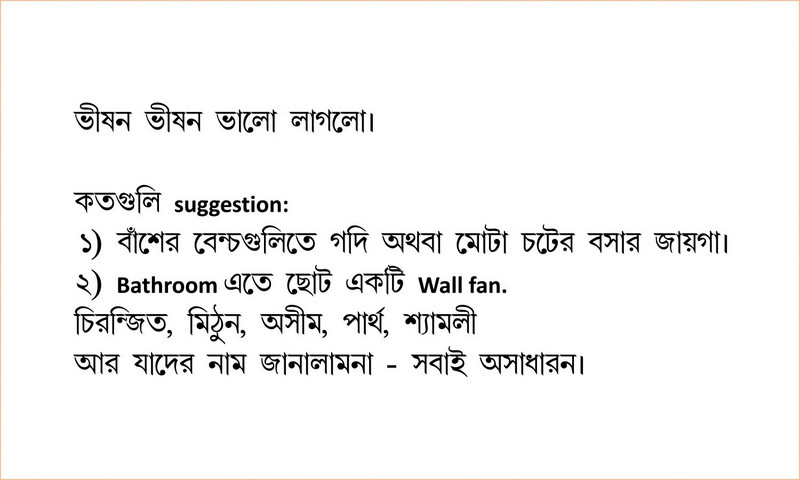 The whole arrangement is fine with delicious purely Bengali dish and well behaviour of the staff. Great Place, Total environment is pleasant. really good. Looking forward with family great and keep it up. Lovely ambience, great experience. Enjoyed every moment. Amazing hospitality. will come again. Total atmosphere of this is veru fabulous. We enjoy very well. Superb – Excellent fresh breath out of city life. Charming experience. Good and clean accommodation. Nice food, timely serviced good hospitality. Very nice experience. Area is beautifully done, nice garden. good maintenance. one thing is required. a proper direction from kalinagar mandir. Thank you. Fulfilling experience. Immersed in nature. Excellent hospitality. Keep up the great work. Love the games. Beautiful Idea. Wonderful experience & too good stay. Very comfortable & very refreshing & too good look after & homely atmosphere. We shall recommend ro our friends, relatives and we will also come in this place hereafter. Best of luck & keep it up. A great place to spend quality time with family and friends. Great food, wonderful ambience and exceptional service staff.. all in all a we take back bags full of memories and smiles.. thanks a lot. all the best. It is always a great experience to be here in Monchasha. One of my very favorite place. Our third visit this year but still its always refreshing and new. Good people, nice environment what else…..thank u again for creating this lovely place & keeping nature intact. My daughters favourite place too. It is a wonderful experience to be have. Thank you to all the people everyone who contribute to make this place so beautiful & a great experience. We would love to come again for a longer duration. Thank you. Had such an amazing time. The setup is beautiful. Thank you for making our family trip a success. Will visit soon. Nice Stay – Good Food. Very efficient service. We enjoyed. A very beautiful & serene place. Very courteous staffs. We loved the experience and would love to come back again. Hospitality is excellent. Nice Place, appropriate for weekend tour. need some good maintains for decoration of room. Otherwise its good. Exclusive experience. Home outside home with warm hospitality. Would love to visit again very soon. Nice Place. Well maintained and service is very good. Green environment is enjoyable. We passed a beautiful time here at Monchasha – Rediscovered ourselves – Looking back to our roots. Found solace to our urbanised irritation – Felt Human once again in our journey to infinite. Keep it up. Beautiful project here to engulf everyone of every ages. Well done Monchasha team for creating such a wonderful project. A true sustainable project. Way to go… Best wishes. It was an unimaginable experience for a Bengali who is born and brought up in hindi speaking north belt. I had hands-on experiencing ethnicity, eco-compatibility and feeling of the village heartland of Bengal. I have no words in this lexicon to express my happiness and feeling inculcation of goodness in physical & mental form. Kudos & thanks for your effort. Please keep it up. We will support you. I have learnt about the place form internet. There I found everything good about the place. After coming to the place I realised the place is not only good but exceptional in many terms. The best part is the ambience and the food. The behaviour of the staff is wonderful. It was a whole new concept and whole new experience for all of us. Keep it up. I hope after years if we come back we will find the place same. Thank you. Home away from home. Will suerly visit to discover more of myself. Thank u and well done !! It is absolutely an wonderful experience to stay here each time I have come. My family also enjoyed every moment here. The ambience is getting better by every passing year. People are also very good (staff). They look after us really well. Will come again. Soon. Nice Place, Service. Well maintained very much. Courteous. Awesome Place to refresh one’s mind, will come again. Excellent arrangements, food, Hospitality. It’s an excellent experience to spend a time in the lap of nature, with delicious food and nice Hospitality. In a word excellent pleasant living quality food along with nice and cordial behaviour of the staff. Really enjoying a lot. Thanks to Monchasha. To get a hang of this dreamland, you start by taking a good look at the design of the very leaf on which you are writing. An oasis literally reachable in a mere three hours drive from the concrete jungle called Kolkata literally because we start the morning with a glass of “chilled by nature” khejurer rosh before sunrise and later freshly thickened gur still warm on palate during breakfast Luchi & aloor torkari as it is your home. Bengali style food is indescribably tasty and in numerous varieties of veg & Non-Veg dishes, all of which instantly starts an argument with wives for not offering same at home. It would be a shame if we do not visit again. God bless Nilanjan & Debjani for conceptualising this fierce Heaven. We Enjoyed Every Bit Of Our Stay….I Love Monchasha! Very Peaceful And Tranquil. Outstanding Hospitality Of Chiranjit. Loved The Village Trip With Kanaida. A Lovely Experience. It Was Just A “Home Away From Home”. Loved The Peace And Tranquility Of The Resort As Well As The Service Of Chiranjit. Amazing. Please Keep Up The Good Work !!! Beautiful! Loved The Calm, Homely Feeling. Excellent Hospitality. Wonderful Venture. Please Keep It Raw As It Is. You Have Kept Upto The Wonderful Bengali Hospitality. We Would Have Been More Happy If You Could Provide The Morning Newspaper. Ambiance And Environment Is The Perfect Picture Of Rural Bengal. Excellent Cooking, Hospitality And Service Provided By Arindam, Chiranjit, Partha And Asim. Amazing First Hand Experience Of Rural Bengal For Us And Our Children. We Loved The Village Experience And I Am Particularly Impressed By The Village Involvement In This Project. As A Testament Of The Good Time We Had, The Children Do Not Want To Leave. Beautiful And Peaceful Environment; Very Relaxing With A Lot To Do. Rooms Are Very Nice And Service Was Excellent. Thank You! Thank You For Such A Joyful Moment Along with Our Pet. We Really Appreciate Your Manager (Arindam). He Is Very Co-Operative And Very Joyful. Rooms Are Very Cozy. It’s Different! Will Spread The News Amongst Others! It Was Remarkable Experience Altogether. The Ambiance, The Cottage, Food, Service Excellent. Promise Will Come Back Soon. Please Keep The Good Work In Future. Thanks Monchasha! Picture Perfect Rural Bengal Created!! Fantastic Ambiance And Environment. Perfect Weekend Gateway From The Busy And Mundane Life. Great Service By Arindam, Asim, Chiranjit And Partha And Not To Forget Kanaida, Laluda And The List Goes On. Shyamalidi. Monchasha Catches Everybody’s Imagination And Fantasy Of Perfect “Gram Bangla”. The Music (Baul), Pottery, Pond With Fish Catching, Paddy Fields, Mud Huts, You Ask For And You Get. In One Word – Mesmerizing. Will Certainly Inform To Friends And Family. Oh! Lovely Food. Touched By The Courteous And Co-Operative Attitude Of Mr.Arindam And His Team. Excellent Cooking. Ambiance Awesome. Monchasha Has A Serene And Rustic Ambiance And Can Serve As A Nice Getaway Place. Monchasha Is A Beautiful And Unforgetful Place To Stay. We Enjoy The Beauty Of The Green Nature And The Speechless Beauty Of Bamboo Cottage Including Delicious Food And Amazing Thought Of Making The Heaven Village. It Is Absolutely Dream Place To Spend Some Days With Peace And Harmony. We Will Come Again Again Whenever We Can. Hospitality Of The Staff Is Remarkable. Thanks To Giving Us “Monchasha” As A Tourist Place. Awesome. 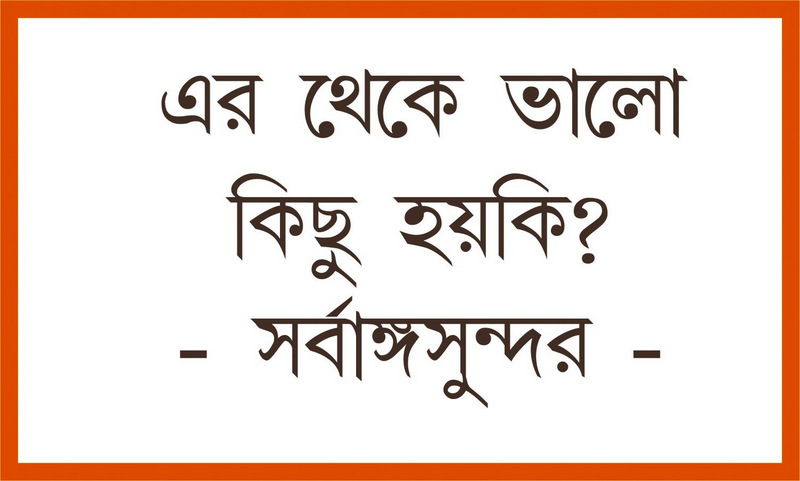 Monchasha Changed My Perspective On Prospects Of Tourism In Bengal. The Place Is Wisely Shaped Up To Give Visitors An Ultimate Comfort And Relaxation. The Quality Of Food And Service Is Superb. Bengali Cuisine Is Perfect, Whereas North Indian Cuisine Needs Improvement. Overall Very Good Experience. Excellent Food, Hospitality And The Ambiance. Enjoyed The Van Rickshaw Ride To The Village. Hope To Come Back Once Again. Pleasant Experience. Will Love To Come Back. Thanks For All The Thought You Put In – The Drawing Board, Books, Toys And The Cycle My Son Loved So Much!! Very Well Maintained Spot For Weekend. Preserved The Very Environment And Ambiance Of Bengal’s Village Life. Food Is Pretty Good, Hospitality Is Excellent. Going Around Local Village And Haat By Van Rickshaw Was A Nice Experience. Keep It Up, Do Not Make Any Changes. We Had A Charming Experience. A Perfect Eco Tourism Setup. An Amazing Setting, Kissed By Nature. Lazy Surroundings. Excellent Staff, Very Hospitable, Very Friendly, Very Flexible. Surely A Great Weekend Breakaway. Excellent Experience And Would Like To Visit Again. Very Beautiful Place With Excellent Service And Food. Impressed For The Village Theme Maintained Along With Eco Farming And Tourism. Very Nice Experience, Excellent Hospitality, Would Love To Be Back Again. Incredible. Unbelievable Opportunity For Us. Beautiful Place, Good Service And Food. We Are Highly Obliged To You That You Provided Us Such A Beautiful Hospitality. The List Is Long. Amazing Food, Tea, Service Everything. Everything Is So Natural, The Song, Scenic Beauty. Please Maintain It And Increase The No. Of Rooms. This Place Is Beautiful And We Were Taken Care Of And Given Proper Attention. The Place Is Clean And Beautiful. Personal Care Is The Key And The Best Thing About The Place. Not To Forget, The Scenic Beauty Is Very Nice. Beautiful Natural Beauty And Good Behavior And Excellent Weather Specially Behavior Of Staffs Is Very Much Good. I Got Enormous Energy And Immense Mental Peace From Here. It Was A Memorable Experience Tour Here. Thank You Very Much For Your Cordial Behavior. I Have Visited Many Similar Joints But Monchasha Had The Best Balance Between Rural Environment And Tourist Needs. We Like Just And Fill Our Best. Enjoy Like Our Home. Beautiful As Usual. Our Third Visit But Still The Same Fascination Of Staying In Such A Beautiful Surrounding As If In God’s Lap So Quiet And Peaceful. My Daughter’s Best And Favorite Place. Place Into The Cloud – Wild Allure. Darun Experience. 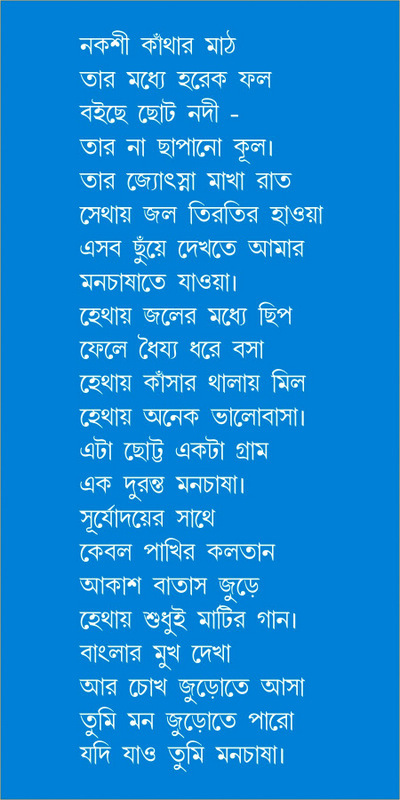 Ek Mutho “Jibon”. Thank You “Monchasha”. We Wish Debjani And Neelu Many More Stories Together. Let This Be Only The Beginning. Thank You. A Unique And Wonderful Experience For Us City Folks. Very Warm People, Great food And A Wonderful Place. We Will Visit Again. Fantastic Experience Just From The Welcome Drinks To The Last Farewell, Fabulous Food And Warm Behavior Of Everyone Around. Monchasha Awesome!!! Food Quality Good, Ambiance Good, Staff Good. Great Place To Relax In Peace. The Food Quality Is Awesome. The Behavior Of Staff Is Homely. Prasenjit And Chiranjit Is Fantastic. Everybody Must Come. Feeling Very Well. Nice Service, Beautiful Place. Enjoyed. Had A Nice Experience To Spend Our Time In The Lap Of Nature Away From The Noise And Rush Of The City. Good Quality Of Food And Village Like Experience. Will Come Here Again. An Absolute Amazing Place. It Was Great To Spend A Day In The Lap Of Mother Nature. Received Excellent Hospitality And Would Love To Come Again Very Soon. Received Wonderful Experience, Unbelievable Hospitality And Sumptuous Food. We Are All Enchanted With The Environment Here. True Village Atmosphere And Other Ambiences, Specially The Children Enjoyed A Lot Here, Which Filled Our Whole Mind. Thanks To All Of You From Us. “All Time Smiling Face” Of “Chiron” Made Me Feel This Place Like My Another Home. We Had A Great Time Here, Very Close To Nature, Very Pure, Lifetime Experience, Surely To Revisit “Monchasha”. We Had Nice Break From Regular Mechanical City Life At “Monchasha”. The Hospitality And Co-Operation From The Owners And The Staff Members Are Really Overwhelming And Commendable. 4 Hours Of Painful Journey Amidst Almost Non-Motorable Road Is Still Worth Coming To A Heaven Called “Monchasha”. It Deserted Yet Lively And Energetic, Perfect Honeymoon Place To Explore And Rejuvenate. Great Innovation And Superb Hospitality. Will Cherish The Memory Forever..
Really A Very Delightful Place And With A Homely And Warm Reception, The Stay Was A Pleasure And Hope Will Be For Each And Every Tourist Who Visits It. Nice Place And Superb Hospitality. A Nice Peaceful Environment Gives Us Complete Relaxation. We Enjoyed And Relaxed. Other Than Me The Rest Of The Group Is Above 80. Feeling Can’t Be Expressed In Words! So Sorry, Come Here – Stay N Experience The Natures Thrill. We Have To Come Back Again. It Can’t Be Better. We Came For Just This. Wish To See It The Same Way Next Time. Simply Great. It’s Really An Wonderful Experience To Stay In Such A Natural Scenario. Great Place To Relax In Peace. The Food And Ambience Is Specially Remarkable To Say. Want To Come Back Again. A Place To Cherish In Solitude. Fresh Air To Inhale The Original Smell Of Earth. Perfect Place For Family Bonding. Wish To Come Again And Again. Thanks For The Thought. Enjoyed A Lot At The Heart Of Nature Monchasha. This Trip Is My First Outing With My Daughter, So This Experience Is Very Special To Me. Brilliant Service. It Was A Lovely Experience. The Ambiance And Food Was Too Good. The Place Is Lovely To Relax. It’s A Second Time Visit…. A Paradise And A Lovely Sojourn… Always Love This Down To Earth People And Environment… A Very Relaxing And A Must Visit Place To Be Away From The Hollow City And People. Thanks To Nilanjanda And Debjanidi For Creating This… Really Really Appreciable And In A Simple And Straight Words “Great Initiative”. Keep Up The Good Work!! Thank U For The Organic Vegetables!! An Unimaginable Experience Of Life – Heaven On Earth! On Exotic, Breathtaking Beauty Of Mother Nature On The Banks Of River, Amidst The Melodious Chirping Of Birds. A Wonderful Gateway From The Hustle Bustle Of The City. Where One Renounces The “Phones” And “Ipods” To Experience The Melody Of Nature. A Beautifully Experience Of A Village Life In An Urban Way. Watch Out, We Will Be Back Soon. Simply Wonderful. Keep It Up!! What An Exciting Location And Experience! We Loved The Lovely Rural Surroundings, Excellent Service And Food, All The Various Activities (Pottery & Boat Ride) Full Credit To All Involved For Giving Us A Lovely Holiday. I Loved Every Second Of My Stay At Monchasha. Everything’s Beyond Words To Express!! Hospitality Is Awesome. Loved It And Enjoyed!! What A Lovely Sojourn Into Nature And Rural Bengal! I Really Appreciate The Effort That Goes Into Maintaining This Quality Of Service With Such Impeccable Taste And Sensibilities. “Bravo”. Invaluable And Unselfish Service By All The Support Staff At This Place. “Monchasha Which Is To Me Simply “Heaven On Earth” – Please Carry On. Where Time Stands Still. Nice Place With Outstanding Service. Please Carry On. Pleasant Stay. Very Homely. Reminds Our Native Place In Uttarpradesh. Nice Food, Nice People Around. Very Homely Atmosphere. “Lazy Life’s Heaven”. Awesome Couple Of Days Spent Admist Nature. Beautiful Place With Beautiful People :: Loved The Whole Experience. Will Be Looking Forward To Return Soon. With Lots Of Love And Luck. Exquisite Surroundings Coupled With Lovely Arrangement Of Hastle Free Stay In Cozy Room – Also Wonderful Homely Alround Treatment With Smiling Face. My Second Visit To This Place. Had A Wonderful Experience. Awesome Food And Mystic Surrounding. It Was An Awesome Experience. Would Like To Come Back. This Is My Third Visit To Monchasha In A Year And I Would Say This Is The Best Resort In West Bengal For Peace Loving People. I True Sense It Has Become My Holiday Home Where I Can Really Feel In Home And Enjoy And Plan Various Activities For Kids. We Had A Gallo Time This New Year With Family. Monchasha As Always Was Very Supportive With All Our Activities Which Include Fire Cracker, Sky Lantern, Water Balloon, Kites, Pottery Making Etc. Sadly We Missed River Cruise And Fishing Due To Bad Weather. Visit You Soon!!! This Place Is Awesome, Far From Maddening Crowd. Life Is Beautiful And Peaceful Here. A Must Visit For All, Highly Recommended. A Big Thumbs Up To You For Creating This Lovely Place And Giving Us This Experience. A Place Of Relief From Urban Hollowness. Tranquility And Cool Breeze, Smiling And Adaptive Host Added With Selective Cruises To Cater The Individual Choice. Far From The Maddening Crowd To Ignite Your Hidden Passion. And Of Course – “Abar Ashibo Fire”. A Lifetime Experience Of A Perfect Village Life. Through And Through A Memorable Outing. The Food And Hospitality Is Indeed Outstanding. Hope To Return Sometime Soon. In One Word “Excellent”. The Whole Concept Is Wonderful, That Can Give The Urban People Like Us A Relaxing Experience. I Must Say That Food Is Very Good And Service Is Extra Ordinary. “A Home Away From Home”. Wonderful Experience – A Must For Relaxing And Rejuvenating From Time To Time In The Midst Of Nature. Excellent Designing Of Cottages And The Surrounding Areas And The Best Part Is The Hospitality. Very Good Service And Delicious Food. Wish To Come Again. Monchasha Is Really A Wonderful Place. I Think It Is The Best Place, I Have Ever Come Tovisit. The Cottages Are Very Exquisite. I Got Dumbstruck When I First Visited The Place In 2012. The Place Is Filled With Lush Green Trees, Colourful Scented Flowers, Rare Birds Etc. The Best Thing I Liked Was The Pure Bengali Food – Dal, Rice, Fish, Chicken, Tasty Sweets. And Another Thing I Truly Enjoyed With Boogie – The Pet Dog, Haridashi And A Puppy. So Thank You Nilanjan Uncle And Debjani Aunty Building Such A Wonderful Attractive Place. Excellent Is The Best Description Of This Place, Food, Hospitality. Wonderful Experience! The Service Was Very Satisfactory. We All Wish You All The Best. Excellent Stay. Will Like To Come Back Once More With Other Relatives/Friends. We Were Amazed By The Quality And Quantity Of Foods Provided. Beautiful Designing Of The Huts And The Premises. Whole Atmosphere Is So Calm And Peaceful. It Gives A Relaxing Effect. Landscaping – Picturesque Of Monchasha – Excellent – Were Well Designed, Met All Over Needs. The Ambiance – Comfort Zone Given By The Team – Very Good, Always With Smiling Face. The Pets Are Enjoyable, After Long Time Had Time To Play Games Like Carom, Arrow, Shuttle. Food Was Mouth Watering And Were Made Specially For Us In South Indian Style. On The Whole Monchasha – Life Time Experience For Pleasant Stay, Their Hospitality To Stay Forever In Affordable Rate. Definitely Deserves A Comeback. Stunning Resort Which Is Ideal For A Relaxed Stay For The Family. Excellent Food, Service And Hospitality. Will Recommend To All Who Wish To Get Away From The Maddening Crowd. One Thing – Paan After Food Would Be Good Addition. The Place Is Very Secluded And Silent And Worth Spending The Night. Will Definitely Come Here Again For A Longer Stay. Kudos To The Hosts! Wonderful Stay And Mouth Watering Food Served Each Meal. Staffs Did Everything We Asked For With A Smile. The Facilities Provided Like Hot Water, Unlimited Tea Coffee, Extra Blanket, Catering To Infant Meals Were All A Proof Of The Enthusiasm And The Training Provided To The Staff. We Felt Like We Were Extended Family Members Of The Didi Whose Smile Is Ever Refreshing. Would Definitely Love To Come Back Soon. In One Word Awesome Experience. The Food Was Delicious. Keep It Up. Awesome Stay. Awesome Food. Really Enjoyed The Stay, Enjoyed The Fishing, Enjoyed The Cooking. Loved The Overall Village Feel. Thank You. Simply Great! Wonderful Place, Great Food, Great Service And Behavior Of All The Staffs And Management. Will Come Again!!! We Had A Wonderful Stay. Debjani & Nilu Were Very Welcoming – All Our Requirements Including The Emotional Ones Were Met. Staffs Did Everything With A Smile. We Are Most Greatful. Wow!! What An Experience. Loved Every Bit Of Our Stay And The Facilities And Service At Such A Remote Place Is Just Great. Thanks From All Of Us. Fantastic Experience. It’s A Discovery For Us That Such A Facility Exists. Will Definitely Come Back For The Experience And Hospitality. I Loved Everything In Monchasha. No Words To Descrive. Just To Beautiful For Words. A Village Resort To Spend The Weekend. I Really Liked & Experienced Its Ambience & Hospitality. Completely New Experience! “Monchasha” Won Our Heart!! Long Live Monchasha!!! A Very Warm & Cordial Experience. Excellent Food. Keep It Up. Best Wishes To All. You Become One With “Panchtatva” Here. Monchasha Is Rejuvenating, Filled My Lungs With Oxygen And Heart With Love. An Awesome Place. Would Like To Come Again And Again. Special Thanks To The Ever Smiling Hospitable Staff. “Son-E Pe Suhaga”! God Bless Monchasha. “Woods Are Lovely Dark & Deep, Miles To Go Before I Sleep”. Excellent Hospitality. A Place Where Time Stands Still. Splendid Experience. Feels Like Going Back To The Roots. Nice Place, Nice Cottage And Outstanding Service. Will Come Back Again. Unique Experience! Giving The Village Feel 100% & Balancing The Requirements Of A Resort!! Difficult To Provide & Maintain But Due Credits To The Management & Operation Team. Excellent! Excellent & Outstanding Service, Superb Hospitality. Overall Experience Is Very Good. Heaven On Earth. Relished Every Moment Of My Stay. Very Clear Attitude Of The Lady Host. Hats Off To Her, For All Her Efforts. Outstanding Experience, Great Food, Unparallel Ethnicity, Simplicity, Service Excellence. Would Recommend To All And Would Certainly Come Back. This Place Did Not Make Me Feel Like I’m Away From Home For Even A Moment! The Fresh Air, Simplicity Made Me Feel Like I’m In Paradise! The Rooms, The Food And The Behavior Of The People Gave Me An Unforgettable Experience. Would Love To Come Back Here! Thank You Monchasha. All Things Bright And Beautiful…. “Monchasha” Is A Paradise Recreated On Earth. Thank You For The Heartwarming Hospitality…. Absolutely Overwhelming !!! Ok! Firstly This Was Totally Unexplored. For The First Time I Felt I Was At Home Away From Home. Maybe It’s The Air, The Simplicity, The Hospitality, The Green Or May Be The Fantastic Weather. Everything Came Together In A Perfect Union Of All The Elements. The Sheer Simplicity Of Village Life Around Makes Me Humble. This Is Where I Feel, You Have Succeeded In Giving A Traveler A Perfect Travel Experience. * “The Rest Is Silence” – Shakespeare. First Time When I Heard About Monchasha Thought It Would Be Just Like Any Other Place. But After Coming To Monchasha I Felt Like I Am Seeing Something For The First Time In My Life. It Is Initially Surreal And Mesmerizing. The Surrounding Is Such Beautiful Seems To Be A Well Crafted And Well Thought Artistry. You People Are Simply Superb. Great Place To Be In. This Is My Second Visit To Monchasha. It Had Been A Wonderful Experience Then, With Friends And Has Been Equally Peaceful Now, With Family. It Is A Place To Get Recharged And Rejuvenated. We Are Mesmerized And Awestruck, By The Innovative Ideas Used In Different Areas. Hats Off To Monchasha!! Staff Team Effort To Make Everybody Comfortable Is Marvelous! Thank You Nilanjan And Debjani! Your Idea Is Great! There Are Two Ways To Travel – Either You Explore Places Or Explore Yourself. Monchasha Is Just The Place If You Opt The Later. The Blissful Ambience And The Divine Nature Of Monchasha Helped Me To Gather Myself And Plunge Into Myself And Plunge Into My Inner Self. I Was Flying High But This Place Reminded Me The Value Of Being Grounded. I Am Refreshed And Rooted To Origin “Monchasha” As The Name Suggests, Cultivate One’s Mind; It Is Indeed Enriching For A Soul Like Me. I Can Remember A Popular Bengali Phrase “Jokhon Pothsranto Hobe Ekhankar Kotha Mone Koro” – How Perfect Is That For Monchasha. Our World Has Become Nothing Other Than A Baggage Of Stress. I Wanted A Break, A Break From Day To Day Monotony . And Monchasha Cordially Welcomed Me And Distressed And Deride Me. I Feel I Got Purified. Be It Mother Nature, The Green Village Or River Bagda – All Became Wine For Last 2 Days. The Fresh Air, The Soothing Music & Down To Earth People Around – All Were Such Perfect Blend. Special Thanks To Debjanidi & Nilanjanda For Making A Home For So Many. A Home Away From Home. Being Warm & Nice Can Win 1000 Hearts And You People Formed That. Thanks To The Staff Team For Being Always Around. Felt Pampered : Got Recharged And Relayed. 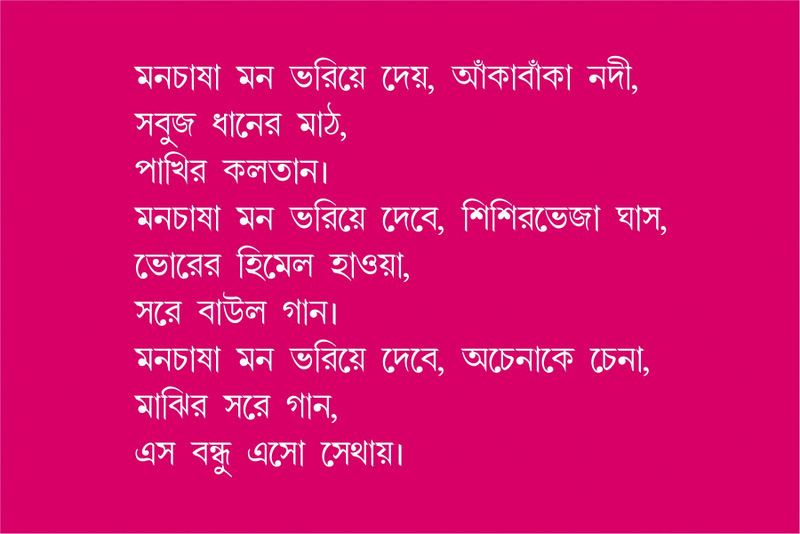 “ Aami Abar Ashibo Fire, Chayasunibir Shantir Neer Monchashate Fire”. Initially The Images Of 4 Cottages Beside A River On The Internet Appeals Us Very Much & We Decided To Come To “Monchasha” For A Short Vacation But After Coming Here We Discovered There Is Soooo Much More Than Just Those Four Cottages – A Tranquil Village With So Much Of Natural Beauty, The Lovely Integration Of Rural & Urban Life (Setting Up Constant Water Supply, Electricity, All Basic Needs Of A City Life In A Remote Village Was A Classic Act), The Beautiful Performance Of The Rare Puppet Show With Its Typical Rural Flavor, The Fantastic Fishing Experience Everything Mesmerizes Us. We Are In Love With This Place. The Warm Hospitality Extended By Everyone Here Is So Inviting. We Are Impressed With The Services. They Are Always Willing To Help. We Don’t Feel Like Going Back Home. Wa Truly Eco-Friendly Resort – Unusually Natural. In One Sentence, I Would Say That It Is Ultimate Peace Of Mind Out Of Busy & Polluted Life. We Don’t Talk, We Don’t Discuss, We Don’t Comment – When? It Happened Only After Watching A Good Cinema, After Reading A Good Book, After Seeing A Good Painting, After Experiencing The Nature. We Are Adding Now – After Visiting “Monchasha”. So Let Us Carry The Hangover With Us – We Will Be Back – Once It Is Over. Thanks. We Enjoyed Our Stay Immensely At Monchasha. Very Much Homely Atmosphere. People Are Too Kind And Friendly. We Being Pure Vegetarian Were Anticipating A Huge Challenge For Food Prior To Coming Here. However, They Prepared Amazing Tasty & Delicious Food. There Is No Word “No” For Any Reasonable Thing Asked By Us. Ofcourse Due To Puja Time We Missed To See / Participate In Many Activies (Like Pottery) As Artists Was Not There. But Overall Very Happy / Unwinding Experience. The Striking Feature Of Monchasha Is Excellent Hospitality Of Staff Members And Specially Debjanidi. Their Service Made Us Feel Like We Are Staying At “Home Away From Home”. The Food Is Excellent And All Of Us Wish To Come Back Again. On Behalf Of All India Women Conference We Think Monchasha Is Excellent For Rest & Relaxation. This Place Rejuvenated My Body And Mind, It Recharged My Soul. What I Liked Most Is Its Simple & Tasty Food And The Behavior Of Its Owner Mrs. Debjani And Its Staff. River Bagda Is Fabulous, The Wind So Refreshing. Wish All The Best, Monchasha!! I Will Have To Come Back Again. To Spend More Time With The Little River. To Enjoy The Rain, The Wet Green & Yes The Wonderful Hospitality. It Feel Like Being At Home. Thank You! I Would Love To Come Whenever I Feel Exhausted With My Work. It’s Only Natural Green Building, Lonely Planet, Excellent Service, Easily Digested Organic Food. We Have New Planet Experience. I Had So Much Fun! The Village Was Beautiful. First Bar Gram-E Theke Khub Moja Hoyeche. Plenty Of Room To Explore & Play. Resort Er Bhetore Ghore Beriye Aar Janla Diye Nodi Dekhte Dekhte Time Kete Gelo. 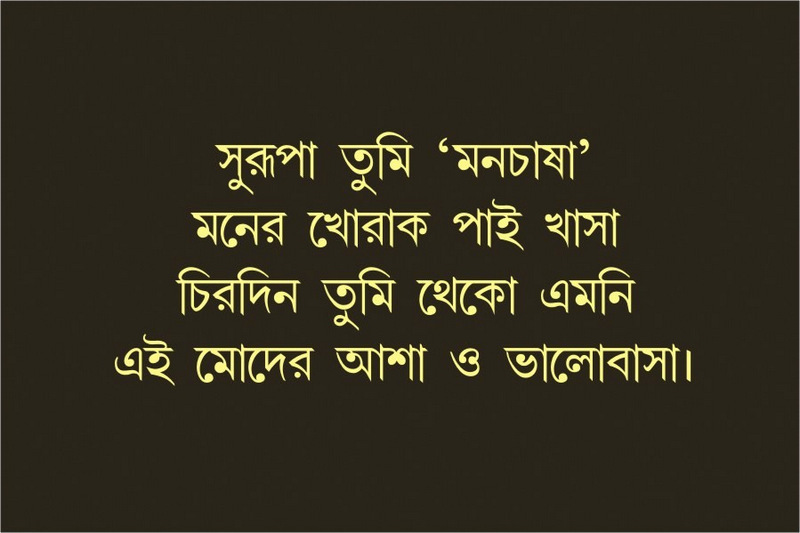 Hut Gulo Khub Bhalo Laglo. Khub Comfortable, Well Maintained Aar Mojar Design. Thanks For A Great Weekend! A Relaxing And Informative Visit. So Little To Do, So Much To Enjoy. A Bumpy Van Ride Into A Village. Endless Cups Of “Lal-Cha”. Sleeping In A Mosquito Net After Years And Above All The Entire Team To Look After All Small Needs…. Most Enjoyable Break!! Awesome Experience. Amazed With The Great Hospitality. Remembered Own Village Life Experience. Pleasantly Surprised By The Completely Rural Ambience And The New Natural Beauty. The Facilities, Design & Décor Have The Perfect Balance Of Tradition And Modernity. The Food, Service And Above All, The Heartwarming Behavior Of The Staff And Hosts (Mr. & Mrs. Basu) Have Left Us Contended. Yet We Can’t Get Enough Of Monchasha. This Has Been More Than A Weekend Retreat; This Has Been An Experience Which Cannot Be Put Down On Paper. Do Keep It Up. See You Soon. Nice Experience, Good Environment, Very Peaceful Place, Very Good Service, We Are Enjoyed With The Hospitality Of The Crew/Staffs. We Would Love To Visit The Place Again In Near Future. Special Comment:- Very Nice Place To Be Here With Family & Friends. Good Food, Soothing Environment, Calm And Composed Atmosphere. The Only Downside – The Chef Must Be More Careful With Extra Bit Of Oil And Salt In The Food Prepared. Overall A Good Concept. We Enjoyed A Nice Peaceful Time, Perfect One Day Holiday. Very Nice Stay, Service & Food. Wish To Come Back Here Very Soon. All The Best & Thanks For Your Excellent Effort. A Perfect Touch Of Rural Bengal With All The Required Amenities Of Urban Life. The Hosts Debjani And Nilu Were So Warmly That We Felt At Home. Comfortable Rooms And Delicious Food Added To The Synergy Of The Beautiful Property In The Midst Of Pristine Nature. Highly Recommended. Will Visit Often With Family. Excellent Property, Great Service, Special Mention Of Staffs Who Were Very Attentive. Good To See Such Properties Coming Up In West Bengal. This Should Remain A Boutique Property. Will Come Back! Very Peaceful Ambience. Excellent Stay …. Calm, Quite And Serene Environment. Awesome Hospitality. Hope To Come And Stay In Near Future For Longer Period. Birds Are Chirping Happily, Melody Of Soft Songs Reverberating, Trees And Creepers Are Swaying, River Is Flowing By The Side. Monchasha Is Yet Residing In The Bossom Of Peace And Tranquility On Top Of The Warm Hospitality ….. Won’t Forget. A Perfect Run Away From Our Daily Routines, The Cacophony Of The City Of Joy. The Final Look Of Sunflower Set Cottages And Organic Farms, Did Make Us Gasp – It Was The Perfect Homely Atmosphere. Cherry On The Top Was – Bengali Food In Authentic “Kansa”R Plates, Muri In “Jhuri”. The 10 Of Us Got The Much Needed Break, It Was Really A Blessed Stay. We Had Came In With Loads Of Uncertainties, And We Leave With Plans Of Coming Back In Monsoon And Winter Too, After The Blanket Wrapped Night Sleep In Midsummer. Thank You Mind-Blowing “Monchasha”. The Serene Atmosphere And The Majestic Environment Mesmerised The 10 Of Us Who Were Here. Out Of The Hustle Bustle Of The City Life This Place Attracts People With Their Beautiful Conceptualisation Of Bringing The Typical Bengal Village. Overall It Is A Place Where It’s Worth Staying For Total Relaxation. Beautiful Place, Great Ambience, Staffs Behavior Is Like Family Members. Doesn’t Feel As If We Are At A Place Away From Home. Would Love To Come Back Again And Also Recommend Friends And Relatives To Visit This Place….. Unique concept of village tourism perfectly blended with heartfelt hospitality has ensured tourist leave with a lasting impression. Not to miss out the sumptuous food and musical extravaganza which was truly, enjoyable. Full moon night, bright colors of holi, songs, adda river cruise and pottery classes. We all enjoyed all of it. Hope to come back with friends and family many more times. In a word very excellent in all aspects. Hospitality as well as the ambience after Monchasha will be remembers for a long time to come. Creativity of the organizers demand some new approach. I stayed here for 2 nights and 3 days. I go to my destination keeping this impression in my mind that I shall have priority to hope this spot while I shall think over staying for weekend tour near Kolkata. Great concept and well executed staff was very friendly and hospitable. Entire stay felt like being at home. Excellent food- authentic Bengali food (especially liked the cchicken & the luchi/alu). Only comment would be to create someactivity if we were to stay more than I visit. First passed by easily but need to do something if we stay larger …..may be some trekking trials or cycling etc. other than that everything was excellent. We started from Kolkata for Monchasha with great enthu but last times of drive changed my mind and mood but as soon as we entered the premises I was tongue tied seeing such a peaceful place in midst of nature. My depression vanished and mood changed & we all were glooming with happiness. Out of the world hospitality, with a personal touch. Good organic food & well cooked. Wishing Monchasha all the best. Being to monchasha is like being to a distant relative who lives in a village and who loves to be host to the hooligans of the city and give them a lesson on what is life is about i.e. love, simplicity and nature. Monchasha gives you a impression of being your second home where you come to recharge your soul. It was a repeat value for nature friendly crowd. A gem of a place in West Bengal. An ideal gateway to break the monotony of crowded city life wonderful experience. Planning to come back for a second time very soon. Eco-tourism (rural) at its best. Hospitality too good. An earnest effort from Nelanjanda, Debjanidi and the staff , Especially Partha and chiranjit. Every one with a travelers heart/mind should visit Monchasha. All the best to team Monchasha. We are really happy for the hospitality of all the staff. Ambience is also very nice. We appreciate the endeavor of Monchasha. It is great and memorable experience and I wish I com back next time with my family and friends. This people are very good and well behave and sweet nature they are great. Monchasha: Great experience….pure & refreshing feel…..so much down to earth….lovely village ambience right from the wholesome Bengali meals and helping cooperative people….Built on an ethos of economic self reliance and ecological, sustainability….fishing, pottery pure fell of village….awesome cottage…lots of greenery, flowers and a home like stay…Awesome…THANK YOU FOR MAKING THIS…. It was a great and pleasure to be a guest in such a wonderful place will come back for sure in near future. Loss of words to describe this place, Fabulous. All was very good a really expect to come back in near future. All are good and excellent. Excellent setup even better hospitality will definitely recommended. Have travelled wide but not experienced the kind of hospitality & services offered by Monchasha. If u want re-energies yourself for your daily routine & away from stressful period, kindly come & stay at Monchasha for 2 days. Monchasha is a remarkable veniure / initiative. We enjoyed stay at this beautiful eco friendly destination. Hospitality was infomatiive and really looked after as well. A1 service & food wish you all the best Thanks. It was a lovely experience, looking forward to our next visit, which will be soon. It will be even more exciting and pleasant if we can have a spa facility. It was a wonderful, restful, experience. Very artistically done up place. Very thoughtful, will come again, excellent service…thank you…. Excellent ambience, food & service facility. However through the rooms should have some storage space. Great experience..thoroughly enjoyed the time away from city life. Excellent service, food and facilities.had a great time making drawings, would love to visit again. Stay to be remembered forever. I enjoyed staying here for a very short time. It is a new experience. I would like to visit here for a longer period. Service is very cordial. Food was also very good. The ambience is fantastic, well thought & meticulously planned infrastructure. Really attractive place for weekend holiday. Excellent hospitality. Service well praiseworthy. Wonderful ambience. Great Hospitality & a great example of eco facility. Keep it up and may God bless. Must impressive. Service really good. Hope it remains like this. A very thoughtful effort. We enjoyed every minute in the calm of the surroundings. Food is very very tasty and service is excellent. We enjoyed very much. Thanks a lot. I can’t express how we spent the goodtime with each other & the wonderful hospitality provided by the staff & the owners at Monchasha. All room amenities were provided & the overall maintenance of the room was perfect & awesome. Overall we had a great experience & wish to come back again. Wish you lots of blessings from God. Really it was an awesome experience, specially the ambience & the hospitality. I would like to tell all my friends & families to visit once. It was a dream comes true. I never expected such hospitality in this place. The design of this place is very good. As an architect I really liked your design. At last a heart full thanks and look forward to stay here in future. To live with the head held high amidst the lap of sylvan pastures, where the mind becomes fearless, where the swings ushers in our childhood & the heart feels free to explore in irrational pleasures …. It’s that place where our soul streams out loud, away from the maddening rush & hustle & bustle of the man made forest made of concrete …. A pleasant and peaceful experience. Beautiful ‘Monchasha’, will definitely come back again. Very good weekend gateway in the nature’s lap. Excellent services and feel like home. Takes the mind off from all the tension of city life. Excellent arrangements. Homely atmosphere. Cordial behavior from all the monchasha family members. Special thanks to Biswajit, Surajit, Chiranjit & Malibhai. Will surely come back again. Awesome concept and wonderful place. A home away from home. Great hospitality, lovely wholesome home cooked food. Great Service. Many thanks for a memorable holiday. Kudos Debjani. Will surely come back again. Missed my family. Specially Sreeya – my sweet little daughter. Unbelievable peaceful ambience !! Missed my friends when with my family & missed my family when with friends. Will come back again !! Great place to relax from the running life. Enjoyed every second of our stay. Correct ambience, natural beauty & food. We would sure want to come here again & again. Simply enchanting…. Makes me long to come back again & again. The trip would not be so memorable without the heartwarming service of everybody present. Kudos to the promoters rather pioneers. Complete different experience. A new way to start the year. Nilanjan & Debjani all the best for your endeavour. Happy new year 2014.